Since the book is written for a general audience, could you say a little about how you would explain the book to linguistic and media anthropologists who are considering using this in a class, and want to know what it is about. For teachers of linguistic anthropology concerned with having an impact on students’ understanding of language and culture, especially beyond the classroom, this book links the classroom with the paid work world. Concepts and methods in linguistic anthropology are highly relevant to job skills. For one thing, there is understanding how local one’s own communication habits and expectations of others are. For another, understanding how communication really works builds better skills to repair misunderstandings. 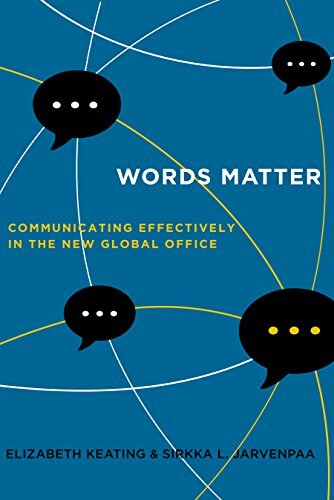 This book rather unabashedly makes a connection between learning about linguistic anthropology and becoming a more flexible, interested cross cultural communicator. One of the main points in the book is that because of technology, many people are working in virtual teams, or virtually with colleagues in other places. This results in little face-to-face time, or time to hang out and learn about others’ habits, preferences, and life stories. There’s little environmental context. Without the ability or time to learn from each other, there is a role for linguistic anthropology principles to play in generating understandings. I’m thinking of general principles like how people do things with words, that meaning is negotiated, social roles, socialization, the workings of convention in meaning, common ground and context, etc. In the book there are examples taken from engineers’ workdays, engineers trying to design things together in virtual teams, while living and working in four different continents. The value in the classroom is the application of linguistic anthropology concepts to the engineers’ struggles with their inadequate communication model. The book proposes a better communication model based on linguistic anthropology. We discuss how culture affects language use, with examples from the engineers and from other researchers’ work. To take a simple example, if the students have never thought about differences in question asking behavior—that it might not be felt to be appropriate in a certain group to ask a question (or only appropriate for the boss to be asking questions)– they could have unpleasant surprises at work if they assume that an absence of questions means everything is understood. In most linguistic anthropology and media classes, students are preparing for many different types of careers, some in similar settings to the engineers. It’s useful to have a way to link linguistic anthropology to students’ desire to prepare themselves for work after university. When my co-author asked one of her graduate business research assistants to read the draft book manuscript, he said afterwards that he didn’t think he should be paid, since he learned so much. Another reader from the business world said he finally understood the reason behind his colleague’s “exasperating” behavior of not asking questions. How do you think your focus on engineers in particular shaped your ethnographic exploration of cross-cultural communication? The focus on engineers shaped our engagement with cross cultural communication in several ways. The first group of engineers we studied in Houston were suspicious of the situation thrust on them by management—that they had to work with a group of engineers across the globe who had unfamiliar habits and approaches. The engineers in Houston were already under a lot of pressure to build a state of the art energy plant under time, budget, safety, and environmental constraints. Working with engineers in another part of the world made their job even more challenging, because they had to work with them in a virtual sense, that is, they couldn’t sit side by side or cubicle to cubicle; they couldn’t see what was going on (puzzled expressions or problem sequences) and participate in so-called informal learning. The engineers they were suddenly working with were in a country where man hours were cheap and materials had always been expensive and scarce (so much so that in former times the engineers in that country could go to prison for using too much steel, they told us). But the Houston engineers lived in a country where it was the reverse: materials were cheap and people expensive. Imagine these two groups designing an energy plant together. One group is assuming a design requiring many maintenance operators, and one requiring as few operators as possible. How to become aware of the other’s habitual ways of thinking before too many hours of design work are done? There were also differences in how you show someone you respect them (by saving time or by spending time?) Although technology was making these work collaborations possible, technology was also a handicap to the engineers being able to learn about each other. This affected how we approached the topic of cross cultural communication. The space of collaboration, the technological interface of computer screens and phone sets, was uniformly absent of distinct cultural cues. When we looked, through a linguistic anthropologist’s research-based view of language and meaning, at their attempts to better communicate, it was clear that their communication model was faulty. They professed the familiar conduit model of communication. They tried to fix problems by being “more clear and direct.” We focused on: How could the engineers approach their collaboration with a view of language, not principally as a conduit for information, but as a tool with many other capabilities? Could you say a little about the experience of writing with someone from a business school? I know of many collaborations between anthropologists and scholars from other disciplines, but this may be the first I have come across of an anthropologist authoring with someone from a business school who is not also an anthropologist (since business schools sometimes show remarkably good taste and hire anthropologists). And I am curious about how this shaped some of the challenges of writing a book together. This is a great question. First let me say that I gained a lot in the process. My colleague is not a specialist on language, but rather on virtual teams and management. Her focus is on how people can most efficiently achieve short and long term goals in a business profitability and creativity sense. She was focused on the practitioner aspect at all times, and fairly uninterested in the minutiae of language dear to a linguistic anthropologist’s trade. The authority of our findings in the book had to depend more on assertions linked to prior language research rather than relying on discovering the findings through a very detailed data analysis of the engineers’ conversations and documents. My business colleague continually reminded me that business practitioners have minimal time to read added material, and they operate in the “three power point slide” framework. After experimenting with different ways to join business and linguistic anthropology goals, we decided to use the engineers as actors in the narrative to keep the content focused on situations likely to be familiar to a reader, or situations that a reader has already experienced and been frustrated by. We created the phrase “Communication Plus” (for communication plus culture) to convey to the reader that they already have a great deal of knowledge about communication in their own culture, but they have to add knowledge about culture’s influence on communication. It was necessary to take a prescriptive stance in the book in order to justify a practitioner’s time spent invested in reading the book. A lot of the engineers we worked with read poetry and appreciate literature and social science, but they also appreciate getting expertise in a manner they can immediately use. Business authors have no problem being prescriptive. My co-author would have been happier if the book was very short, with very short paragraphs. I felt it was necessary to have as much material about language and anthropology as possible. I am happy to say that over the course of the time writing together, my business colleague became convinced of the power of the close analysis of transcriptions of conversation, in this case conference call meetings. I became more aware of the pressures on people to perform in the constantly changing, globalized work world. Cross-disciplinary research and writing requires extra investment in time for the authors, managing differences and gaining some knowledge of the other author’s vocabulary, research goals, validation standards, methods, even what counts as a ‘finding’ or what’s cool. Similar to the engineers, we were both frustrated with each other’s practices and habits of thinking at times. Are there insights you had about the interactions you observed that you were unable to write about because it would require too much specialized knowledge on the part of your readers to explain the ideas adequately? I was not able to write about indexicality in a way that showed the importance of the concept and its ubiquity in communicative encounters. It’s a very abstract term that most people haven’t encountered before. I found that Garfinkel’s notion of ritual status degradation was very useful in analyzing what many of the engineers complained constantly about (feeling treated as non-humans by others due to the symbolic expression of respect taking a different form). Although Garfinkel meant something grander like pulling down the statue of Lenin or politically motivated imprisonment, the notion of ritual status degradation gets at the great seriousness of “small” slights like problems with greeting rituals among the engineers. No salutations in emails provoked surprising anger. Similarly, I found that Goffman’s notion of “spoiling” identity was a useful way to analyze problems I saw the engineers experience when they disagreed about what the “right” (“good engineering”) design was, conflicts that became intractable because “wrong” was just different or unfamiliar. Writing about ritual status degradation and the spoiling of identity didn’t work well in the book, though. What worked better was a discussion about cultural differences in theories of the person (ideas about personhood that explain differences in things like greeting patterns and why the wrong pattern can be so offensive). It worked well to discuss the idea of language as action (looking beyond content of utterance and the referential function of language). I would have liked to bring more conversation analysis principles into the book. Since the 1980s, anthropology has had a vexed relationship with the culture concept – often to the surprise of people outside of anthropological circles. In this book you talk about culture and cultural misunderstandings without any caveats, and I am hoping you can say a little about your embrace of culture as a strategic decision or intellectual commitment. I’ll illustrate some of the problems you are alluding to with an anecdote which addresses your question. My co-author and I were working on an article for an engineering journal, before we began the book. She said, “okay, we have to define culture.” I stared at her, incredulous. Isn’t this the honorable work of still generations to come?, I thought. Isn’t this misdiagnosing the solution to our ignorance? She didn’t see the problem, not having been a party to the discussions anthropologists have about this (discussions as you say “to the surprise of people outside of anthropological circles”). The engineering journal reviewers also insisted on a definition, as part of their editorial job of questioning our scope. I got inspiration from Duranti’s and Keesing’s discussions about culture, and we added reference citations for Schein of MIT’s work on organizational culture, Foucault’s work on institutions, Wolf, Bourdieu, Bateson, Parsons, Kuper, Lave, Garfinkel, and Henrietta Moore’s piece on concept-metaphors in anthropology. A second anecdote concerns what happened each time we went to an engineering firm to introduce ourselves and get started collecting data. In the beginning of the project we were three, and we arrived on site together: a business professor, an engineering professor, and an anthropology professor. After the introductions, the engineers invariably focused all their attention on me (of course business and engineering were already quite familiar to them, but for those of us experiencing the recent assaults on the Liberal Arts, in demands for proof of our continued relevance, this was a great endorsement). The engineers said things like “yes, we really need to know about culture” and “we hope you can help us understand culture better.” They knew cultural misunderstandings were affecting their projects’ success and their job satisfaction. They had had some very frustrating and expensive experiences, but they didn’t know exactly how to learn from them. I would say my embrace of culture came from the engineers. There were particular aspects of culture more relevant to their situation, their situation being little if any face-to-face contact, lots of email correspondence (where requests and problems with responses to requests were frequent), group conference calls, expert-expert interactions, non-native English, and few, if any, shared work hours of the day. Some of these problems I’ve already mentioned. I found talking about identity an accessible way to discuss cultural influences on work collaborations. We tried to show how cultural practices that were annoying and threatened relationships (such as being too direct or being too indirect) had a moral basis. Not getting expected behaviors, as Garfinkel showed in his famous breaching experiments, results in people attributing malicious intent (people are held accountable). Being aware of the range of perspectives in human societies is a step to avoiding these ascriptions of harmful intent. Talking on the scale of culture easily leads to overgeneralizations and oversimplifications and I’m sure they are in the book. We found that the engineers, and others we interviewed like them, have an appreciation for diversity and are aware of the inaccuracies and hardships that can stem from overgeneralization and overattribution. Embracing culture was the way I felt we could bring linguistic anthropology to a readership dealing with globalization.